Good, brief read, with a beautiful display of courage. Captain Sunan is the skipper of the Kulap Kanya, and Munny looks up to him as a hero. The Captain always knows what to do and when to do it: when a stowaway is discover on board the ship, Munny is confident that the Captain will give the miscreant over to the jaws of Risafeth, goddess of the sea—for all stowaways are hers by right. But when Captain Sunan unexpectedly vows to bring the stowaway alive to harbour, the life of everyone on the ship is thrown into jeopardy. With the life of the stowaway placed in Munny’s care, will he choose to let the strange foreigner die, or will he, too, risk the fate of the ship to save one man? Humankind is accurately portrayed in this novella of Goldstone Wood’s stories. Among heroic sentiments, cowards, the honourable and the superstitious, Stengl maintains a firm line of morality and beautifully praises godly behaviour. As with the rest of the Goldstone Wood universe, the faerie world comes into play in this novella. Some of the fey proclaim themselves to be gods and goddesses, and accept the worship of mortals, but there are those who do not acknowledge the deity of these beings. Life on shipboard is rough, and as the bottom-most rung of the social ladder, Munny gets stepped on a lot. He is often beaten and mistreated, but the violence, while realistic, is never graphic. None explicit. A character is referenced as having married beneath her station and her family refused to acknowledge the alliance, so that her child is looked on as illegitimate. This is only a novella, not a full-blown Goldstone Wood novel, but it packs an excellent story all the same, depicting a beautiful image of courage and self-sacrifice and the world’s confusion over watching something foolish be saved from a demise it probably deserves. This is not your typical sea-yarn! 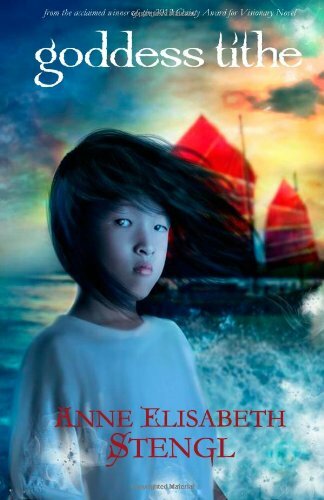 Between Munny’s life on shipboard and the intrusion of the faerie world to grasp a mortal’s life, this voyage of the Kulap Kanya is a rollicking ride. It is exciting, sweet, full of the simple ambitions of a boy to whom life is little more than the next seaman’s knot and a cluster of mystical white flowers. Do you enjoy The Tales of Goldstone Wood? I recommend this novella!